A serial code for account upgrade. Access to the Vision of Lyssa Costume. When your character wears the Vision of Lyssa Costume, he or she will capture the glamour and mystery of the twin goddess of beauty and illusion. This elegant costume with matching mask fits into the costume slot on your character panel and can be worn over existing armor. 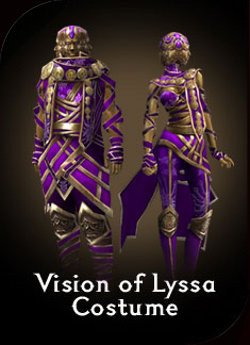 How to redeem - Once the Vision of Lyssa Costume serial key is applied to your account, speak with the [Costume Maker] located in Lion's Arch, Shing Jea Monastery, Kamadan, and the Great Temple of Balthazar. This NPC will provide you with your costume. Once purchased, any character on your account can speak to the [Costume Maker] to receive their own Vision of Lyssa Costume.